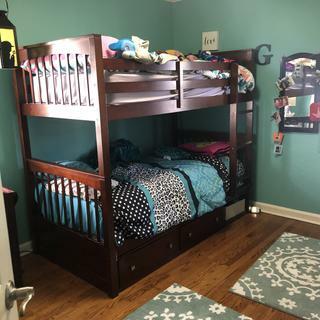 Good quality bunk bed, seems to be made well and of good wood. Looks great in our kids bedroom. Very happy with the delivery team as well, super quick and easy. Great solid bed! The only reason we are not giving it 5 stars is because the storage draws under the bed aren’t secured to the frame. I was able to attach a bracket to it so that they slide further under the bed when pushing the drawers in. 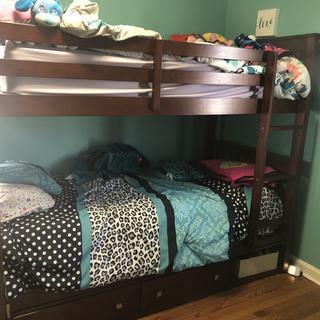 I got these bunk beds for my grandsons. The beds are great -- nice and sturdy. However I regret adding the drawers under the bed because they are very small and not stationary. Every time we open/close a drawer the whole drawer "cabinet" slides around because it isn't the full depth of the bed. I put plastic storage bins behind it so that it doesn't slide. I would give the bed 5 stars, but the drawers only 1 star. 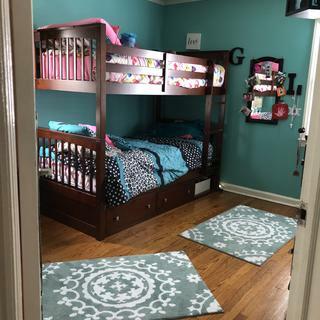 can the drawers be located at either end? what is the width of the opening next to the drawers. BEST ANSWER: Yes. The storage drawers can be put on either end. The open cubby dimensions are L: 18" x W: 15" x H: 8.5"